So here's card two of my three-cards-with-one-stamp card set for twopeasinabucket.com... The stamp I am playing with is one of my all time favourites - Hero Arts Sleepy Fox. To make the tag, I lightly stamped Hero Arts Raindrop Background onto kraft card with Antique Linen distress ink, then stitched the edge and inked with Vintage Photo ink. I used more yummy flocked Thickers, inking the edges to coordinate with the tag. The fox is stamped onto more Gertie paper, and his nose is a little Hero Arts pearl. Yummy seam binding and twine from The Ribbon Girl finished it off. A fab card. Your blog is really lovely havejust become a follower. Absolutely LOVE this. The little fox is NOT jaundiced... he's just darn cute. So cute! I love the nose detail and the inking, I always love the inking! What will I do if that totally goes out of style??? I'm headed over to 2p's to see the rest! I like the pink fox too. Just changing the color totally makes a different card! LOL! Your hubby is funny but kind of right... :) It's a gorgeous card - your inking is amazing! This is adorable! 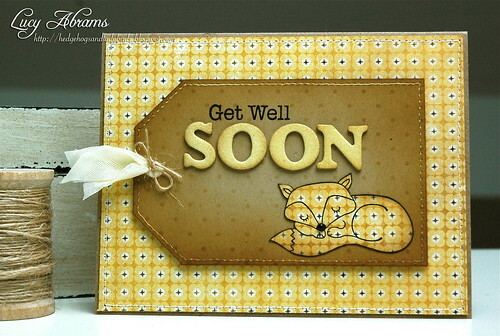 The paper-pieced fox is perfect, and I love your sponging. Great card! Great card, love the big tag!